Custer State Park in the beautiful Black Hills of South Dakota is home to one of the world's largest buffalo herds. Each fall the ground rumbles and the dust flies as cowboys, cowgirls and park crews bring in the thundering herd. The roundup serves ecological and environmental purposes. Overview: The roundup serves ecological and environmental purposes. The first part of the roundup involves moving the entire herd into a system of corrals along the Wildlife Loop Road. While in the corrals the massive animals are sorted and categorized by Custer State Park's resource personnel. Details: This 71,000 acre State Park with it's of lush forests, quiet and serene meadows and majestic mountains provide food and shelter for nearly 1,500 buffalo. To control the size of the park's bison population, a portion of the herd is sold at the annual Buffalo Auction, the third Saturday in November. Those animals chosen to be sold are retained in the corrals, while the remainder of the herd is turned back out into the park. The revenue received from this auction remains in the park and comprises a portion of the park's annual operating budget. 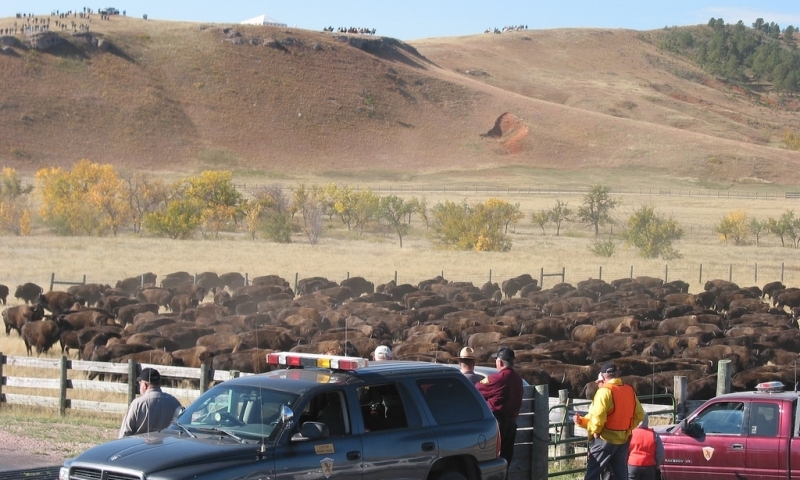 The Custer State Park Buffalo Roundup is open for public viewing. Find more details on the Custer State Park website. As the official lodging concessionaire in Custer Park, we offer hotels, log cabins and lodges for all budgets plus dining, trail rides, Bison Jeep tours & chuckwagon BBQs.